Renowned sushi chef Gino Choi just unveiled OMakase by Gino on North Main Street in Santa Ana. The 10-seat restaurant is the latest addition to the corner of Downtown that includes MixMix Kitchen Bar and Mission Bar. Chef Gino’s OMG is a true omakase experience for serious Orange County sushi lovers, highlighted by fish flown in daily from Tsukiji Fish Market in Tokyo, plus an array of local seafood from purveyors Gino has worked nearly 20 years to seek out and build relationships with. The result is an explosive, intense journey through the mind of one of North Orange County’s most celebrated sushi chefs. Gino was born in Seoul, South Korea. At age 22, he immigrated to the United States with his family. His love for sushi came from his grandfather, who was raised in Japan. Gino took numerous trips with his grandfather to Japan, where the two bonded over eating sushi at the local fish markets. He opened a sushi restaurant in Tustin soon after arriving in 2003. Through random circumstance, Gino found a mentor in Kikuchi Hideaki, sushi chef and owner of Kikusui in Torrance. 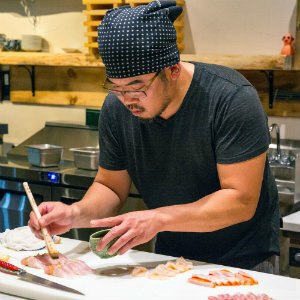 Gino was used to cooking Japanese fusion, but under Kikuchi’s wing, Gino learned traditional sushi techniques. By 2007 Gino opened a new sushi restaurant, Kaori in Fullerton, where he achieved a large following of locals and non-locals over 11 years. He recently sold his stake in the restaurant to open OMG. Gino wants OMG to highlight his skills in selecting the best seafood and preparing it with exacting simplicity; for the space to honor tradition and welcome experimentation within the same meal. 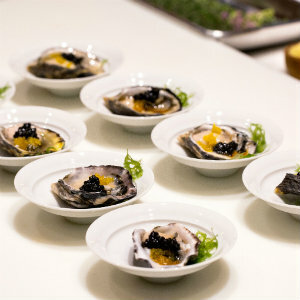 Omakase is a chef’s choice tasting menu of appetizers, sashimi, nigiri, signature dishes (owan) and dessert. The menu at OMG changes daily, and features an array of fish and seafood including otoro, bluefin tuna, Japanese kampachi, seasonal rockfish and more. Other ingredients Gino features include Hokkaido uni, Kushii and Kumamoto oysters, flying fish eggs, clams, blue crab, scallops, foie gras, monkfish liver, and tomago. Two Seatings per night at 5:30 & 8:30 p.m.